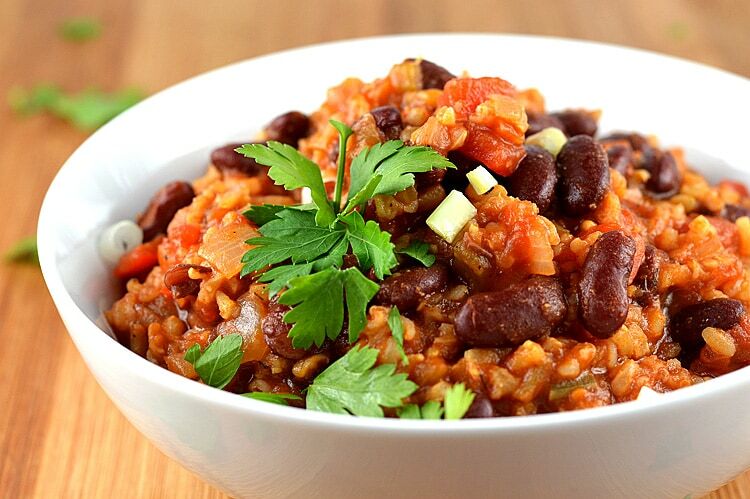 This week’s “Meatless Monday” recipe is Vegan Red Beans and Rice. Not only packed full of flavor and protein, it is also very economical! 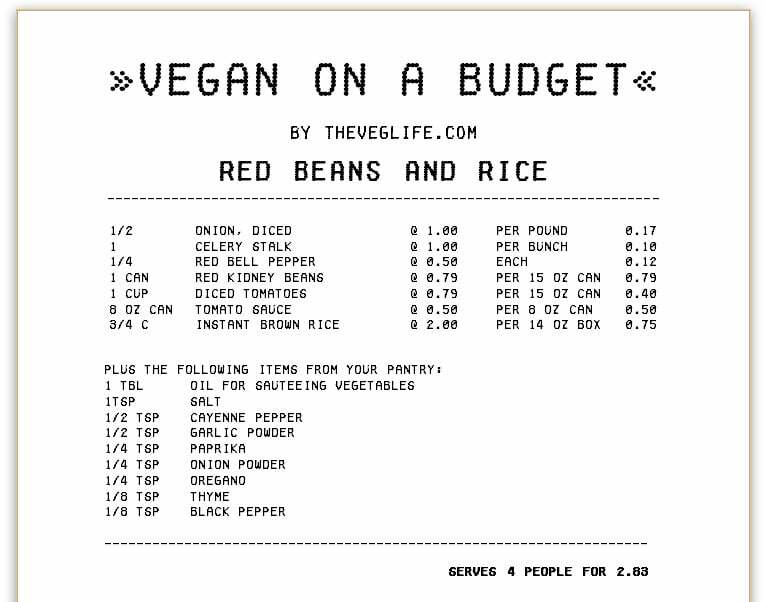 So this week, we’re combining our Meatless Monday with our Vegan on a Budget series. This hearty meal serves four people. Before we get started on the recipe and for those who are following this particular series, here is the cost analysis breakdown. 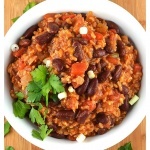 This recipe serves four people at just $0.71 per person! Making this dish couldn’t be easier. I first sauteed the vegetables. These included onions, celery and red bell pepper. 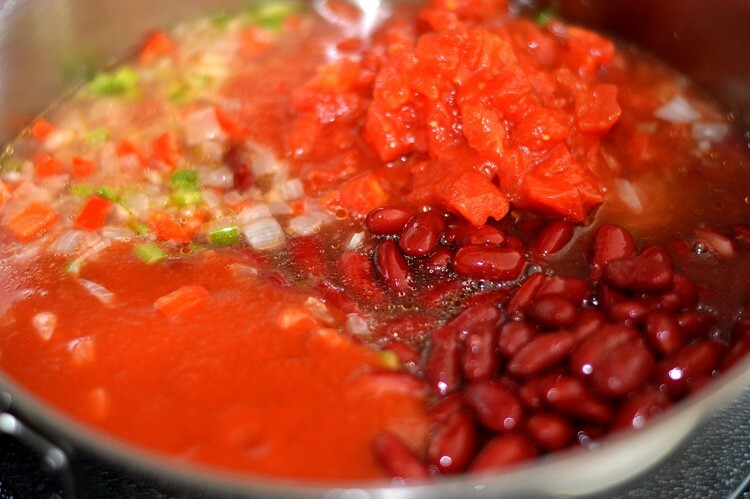 After the vegetables have softened, I add the kidney beans (do not drain), diced tomatoes and tomato sauce. I also add the water at this point. This extra liquid will be what helps cook the rice. Now it’s time to season it up! And this is where personal preference comes into play. If you like it spicy, add more. Are you like me and prefer it a little less spicy? Simply add less. If you have Cajun seasoning on hand, you are ahead of the game. If not, it is really easy to make from spices you probably already have in your cupboard. 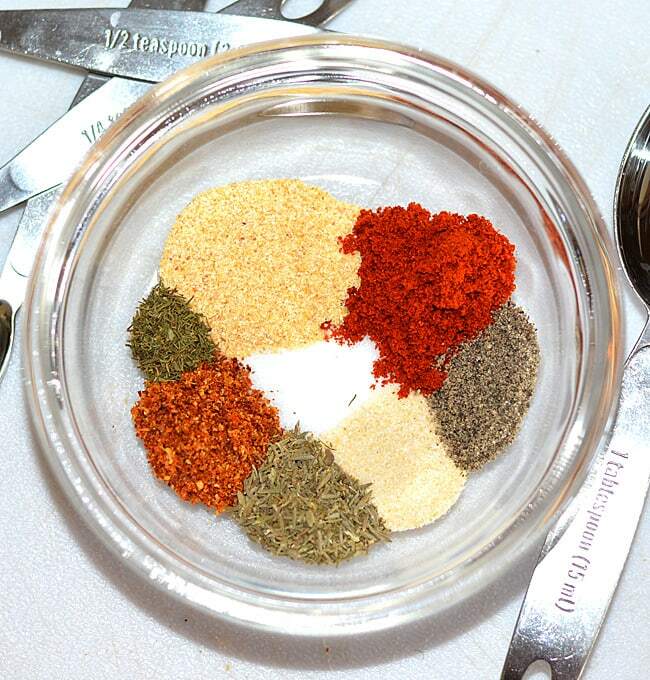 Cajun seasoning is merely paprika, salt, pepper, cayenne pepper, garlic powder, onion powder, oregano and thyme. I’ll include the recipe below. I actually preferred this blend to the bottled version. Whisk the spices to combine and then add to the sauce. The last step is to add the rice. This is instant brown rice, not the boil-in-bag variety. If you are unsure, the proportions should be something like 1/4 C dry makes 1 C cooked. We’ll be using 3/4 C dry, so that will yield about 3 C cooked. Bring the sauce to a boil, reduce heat and simmer for 10 minutes or until rice is tender. Remove from the heat and let sit uncovered for about 5 minutes. This will help further thicken the mixture. My favorite way to enjoy this meal is with a slice (or two) of bread with a bit of vegan margarine. You could also add a dollop of vegan sour cream on top. Garnish with green onions and/or fresh parsley. 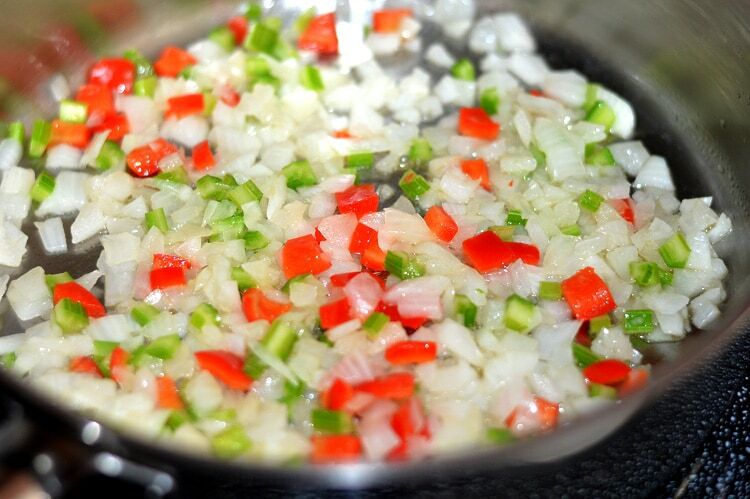 In a large saute pan over medium high heat, place 1 Tbl of oil and the diced onions, celery and red pepper. Saute until tender. Meanwhile, prepare the spice blend. Alternately, you could simply use about 1 Tbl Cajun seasoning. 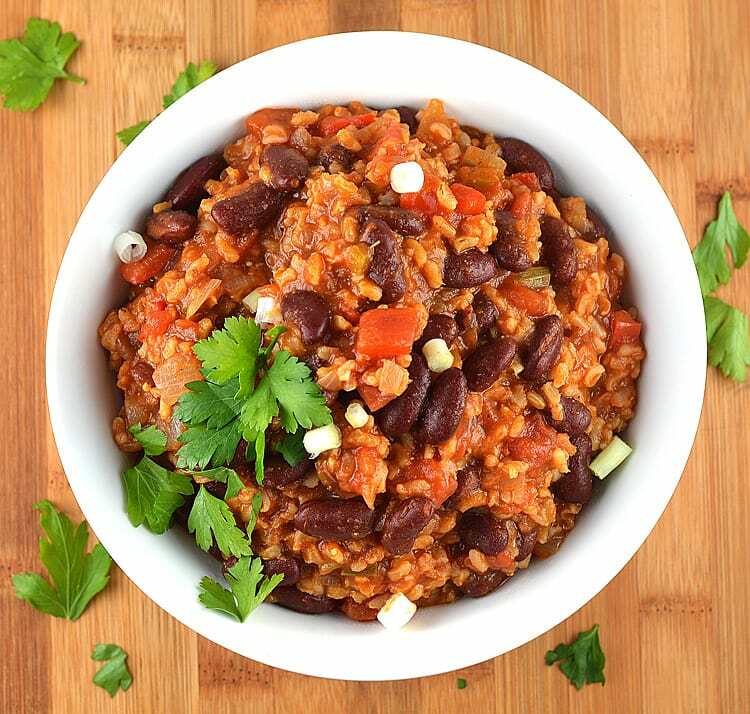 To the cooked vegetables, add the undrained kidney beans, diced tomatoes, water and tomato sauce. Add the spice blend and stir to combine. Add rice, bringing to a boil. Reduce heat and cover, cooking for 15 minutes or so until rice is tender. Let stand for an additional 5 minutes off heat. The mixture will continue to thicken.